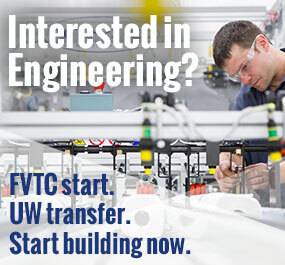 Put your creative and problem solving skills to good use in one of FVTC’s engineering mechanical design programs. You’ll learn how to create the drawings used to make products, tools and machine components. Use your creativity to solve problems and create new products. Develop the technical skills needed for entry-level work in an engineering department. You will learn to interpret and prepare mechanical drawings of products and machine components to the specifications of the designer and/or the engineering team. You could also investigate other areas of the design process such as strength requirements, material choice, product improvement and cost savings. In addition, you’ll learn about manufacturing processes, technical drafting and technical math. Develop the skills you need to be a productive team member in an engineering department. Learn how to work with mechanical engineers to prepare and interpret drawings of products and machine components. You’ll also learn how to solve design problems relating to shaft type and size, bearings, gears and fasteners. Your work may include investigation of strength requirements, material choice, product improvement or cost savings. Or you may work with engineers creating new consumer products. Either way, you’ll have a solid base of technical skills and great career possibilities.